The Dolgellau Gold-belt runs, arclike, southward from near Trawsfynydd, around the eastern and southern flanks of the Harlech Horst (formerly Dome) and out to the Cardigan Bay coast near Fairbourne. Throughout this tract, middle and upper Cambrian sedimentary rocks and associated intrusions comprise the solid geology. They are unconformably overlain, to the SE, by subaerially erupted basic island arc-type volcanics (the Rhobell Volcanic Group) of lowermost Ordovician age. The Horst itself is a fault-bounded block over which further, older, Cambrian sedimentary rocks outcrop. These overlay a sequence of island-arc volcanics of postulated late Precambrian age, proved in a borehole. The nature of the basement remains unknown. Mesothermal gold-quartz lodes are common throughout the Gold-belt, but have only produced significant gold at certain localities. The total recorded output of the Gold-belt is ca. 4 tonnes of gold, mostly being produced by two mines, Clogau and Gwynfynydd, in the late 1800s and early 1900s. Intermittent exploration and production have continued to the present day, with the last large-scale mining activity being at Gwynfynydd mine in the 1983-1998 period. It is an area that has interested me since 1980, when I was taken to Clogau mine, then at work, and saw the stunning high-grade ore being mined at the time - chunks of quartz with visible gold sticking out all over the place, with here and there the glitter of tellurides. Since then much research has been done by several workers: the age and sequence of the mineralisation are both better understood as is the chemistry of the mineralising fluids. But there is still plenty to look at! Ffestiniog Flags Formation - 650-1020m thick: massive or poorly bedded pale to dark grey silty mudstone with thinly-bedded light grey coarse quartzose siltstones. Maentwrog Formation - 700-1200m thick: coarse quartzose siltstones alternating with dark mudstones ("Vigra Flags" of earlier authors), passing up into dark mudstones ("Penrhos Shales"). 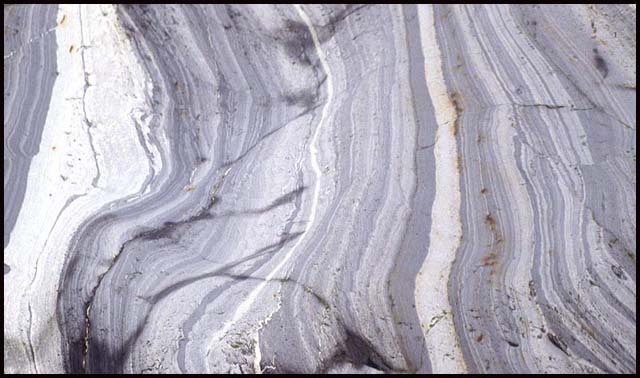 Clogau Formation - 90-105m thick: dark grey or black carbonaceous mudstone. The Clogau Formation overlies the Gamlan Formation, which consists of rather monotonous grey mudstones and siltstones; the junction between the two is marked by transition beds in which Clogau-type and Gamlan-type facies alternate. Above: Transition beds in the lower part of the Clogau Formation exposed on the wavecut platform at Friog, near Fairbourne. The pale band through the middle of the image is ca. 3cm in thickness. Intrusive rocks of intermediate to basic composition ("greenstones") are abundant. The larger greenstone intrusions, for example in Coed Y Brenin, carry porphyry-style Cu-Mo-Au-As mineralisation. The Coed Y Brenin porphyry copper deposit was drilled in the late 1960s-early 1970s (Rice and Sharp, 1976), but both economic and environmental factors prevented it from being mined. Above: hand specimen of "ore" from the Coed y Brenin porphyry-copper deposit. Highly altered intermediate intrusive rock carries veinlets and disseminations of chalcopyrite and tennantite. The minor intrusions are dominated by sill-like bodies which are abundant throughout the Mawddach Group, and range in thickness from only a few cm to tens of metres. Compositionally they are dioritic to doleritic: however, pervasive hydrothermal alteration has removed most primary igneous minerals, replacing them with a quartz-chlorite-sericite-carbonate assemblage, giving the rocks the dull greeny-grey colour which led to the name "greenstone" being coined. Dykes are less common. 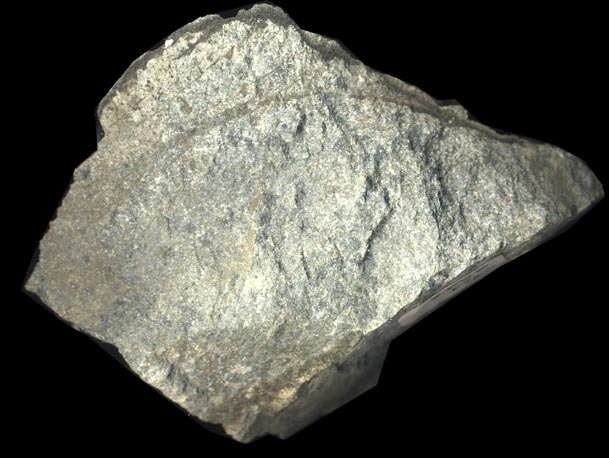 Above: sample of "greenstone" from an intrusion in the bed of Afon Mawddach. The Rhobell Volcanics consist of porphyritic basalts and lava-breccias. 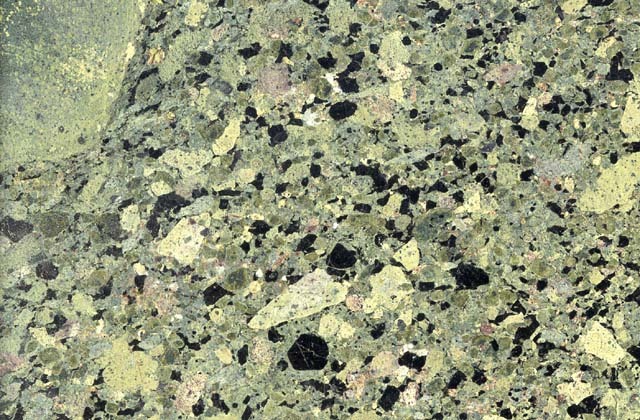 Large black phenocrysts of the amphibole pargasite are a frequent feature, as is the vivid pale green colour of these rocks due to the generation of abundant epidote as a consequence of late hydrothermal activity. Rare intrusions of a similar appearance have been identified in the Mawddach valley and in contrast to the main "greenstone" suite, these are relatively unaltered. Above: part of a large cut and polished slab of lava-breccia from the Rhobell Volcanics. Note the black pargasite phenocrysts (to about 1cm in this image) and the green colour - a result of epidotisation. The area has undergone a multi-stage history of uplift and folding. Initial folding on a N-S axial trend occurred prior to and immediately after the eruption of the Rhobell Volcanics. The major folds of the district were formed at this time, though they were probably accentuated by the Acadian deformation during the Devonian Period. The gold-lodes consist of quartz with calcite, chlorite, white mica and sulphides. Their metalliferous content varies strongly. For example, at Clogau, sulphides are relatively minor, while at Gwynfynydd they are abundant. The lodes mainly trend ENE. They occur in anastamosing groups, which may be in excess of 5 km in strike-length. In terms of width, they vary from thin stringers to large bodies of quartz 10m in width. A more typical width for a major lode, however, would be 1-2m. Typically the veins display multiple book-and-ribbon textures (L) indicative of repeated fissure opening and pulsed hydrothermal activity. Different "ribbons" often contain different mineral assemblages. flatten out when passing into shaly beds, where dips as low as 40o have been recorded. 60-80o is more typical, however. 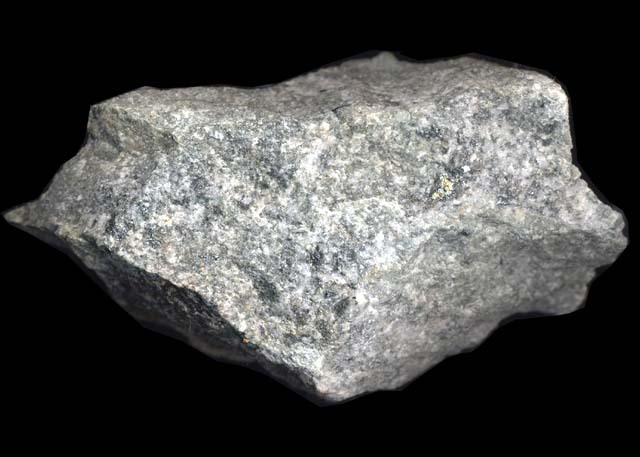 Outside of Stage 2, rarer mineral species include cubanite and mackinawite. Within Stage 2, tellurides of bismuth, lead and silver occur, the most important being tellurobismuthite and tetradymite, regarded, especially at Clogau mine, as strong indicators of nearby gold. Rarer tellurides include aleksite, altaite, hedleyite, hessite and pilsenite. Accompanying the tellurides are various Pb-Bi-Sb-Ag sulphides including bismuthinite, boulangerite, bournonite, galena, matildite, pyrargyrite and tetrahedrite. 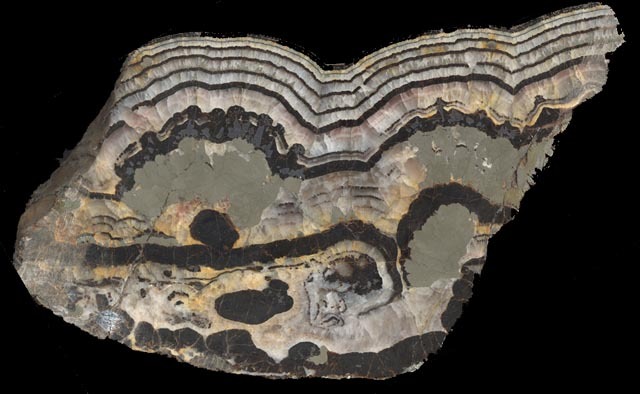 In petrological terms, the telluride minerals typically occur in complex intergrowths, where what appears to be one mineral in hand specimen turns out to be three or more! 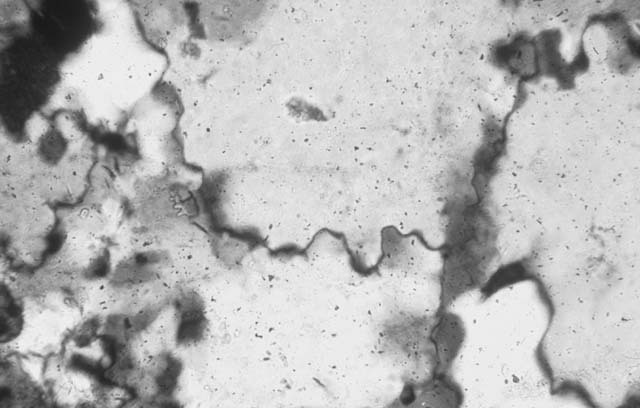 Above: telluride intergrowths in polished section (field of view 250 microns across). Tellurobismuthite (bright white) contains stark blue-grey "hieroglyphs" of galena. Tetradymite (slightly duller-grey than tellurobismuthite) is also present. The intergrowth is thought to have resulted from the unmixing of a precursor phase. Sample from Clogau mine. Gold occurs as the native metal and also in various combinations with silver (including rare lemon-yellow electrum). However, much of the gold is of very high fineness. Not evenly distributed throughout the lodes (to the cost of a number of failed mine operators, who assumed that it was), it is instead localised to specific areas where the correct combination of structures and lithologies is satisfied. Hence, well-constrained ore-shoots occur which are limited in tonnage but in which pockets of extremely high-grade ore are encountered. The location of these shoots with their spectacular pockets cannot generally be done by conventional exploration methods such as geophysics, diamond drilling etc. Instead, the logical way to approach the issue is to develop exploration drivages in carefully-modelled, geologically favourable selected areas. Historical accounts (Hall, 1990) frequently show this approach to have been successful: "he was rewarded by the discovery of a small bonanza....this yielded well from April to June 1867.... more than 500 oz being got from a section of vein 6ft long, 4ft 6in high and 9in wide". Above: large hand-specimen of bonanza-gold ore at Clogau mine, 1980. Note the grey patches - these are bismuth tellurides. The barren milky-white quartz beneath the sample is what the miners refer to as "White Elephant" quartz - see below. The lodes of the Dolgellau Gold-belt were for many years thought to post-date the regional mountain-building that occurred during the Devonian Period (the Caledonian, or more recently Acadian, Orogeny). However, in the 1990s, increasing evidence for deformation in the veins themselves was noted, culminating in the discovery of the Friog section near Fairbourne, where the lodes are very clearly deformed, with folding, boudinage and fracture-cleavage developed (Mason et al, 1999). Within boudin necks, new quartz has been deposited in brittle dilatant openings. In the mines, this is referred to as "White Elephant" quartz: late, flat-lying bodies of barren (hence the name) quartz repeatedly straddling the lodes. 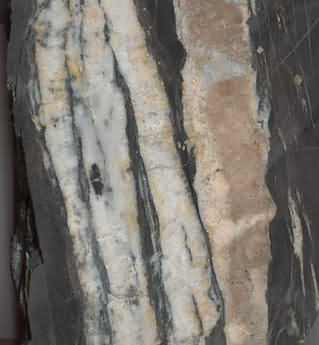 Examination of the Clogau examples has revealed the additional presence of a number of minerals typical of syn-tectonic quartz veins elsewhere in North Wales, including chlorite and rutile. 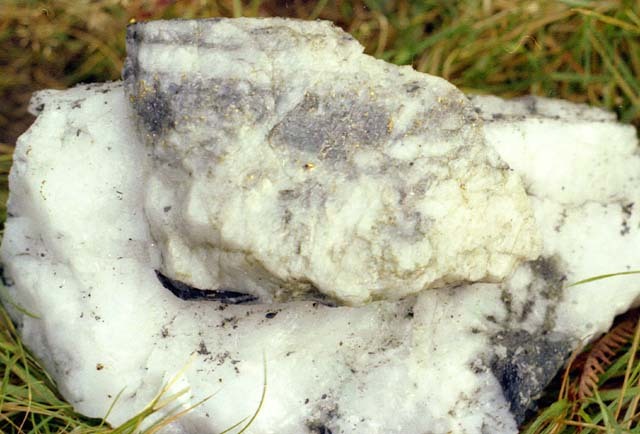 The "White Elephant" quartz has demonstrably formed as a result of brittle dilantant fracturing in response to upward extension of the ENE-striking lode, under a NW-SE oriented field of intense compressive strain. The Friog site is now a geological Site of Special Scientific Interest. Above: buckle-folds in a quartz-sulphide vein at Friog. The folding is best seen in the smaller veins. Petrological examination of lode material from other Gold-belt localities reveals extensive recrystallisation of sulphides and the quartz typically shows high-strain fabrics with deeply sutured grain-grain margins and shadowy extinction. These are all to be expected as a result of a regional compressive deformation. Above: thin section of sutured quartz grain margin - typical Gold-belt quartz - from Gwynfynydd mine. Field of view 250 microns across. The Gold-belt veins are thus age-constrained, rather loosely it has to be said, between the age of the youngest host-rocks in which they are found (apparently the upper Cambrian Ffestiniog Flags Formation) and the Devonian deformation. The lode system at Clogau cuts and displaces an early, pre-Rhobell fold axis. Having managed to constrain them so far, I have to guess beyond that! Early Ordovician uplift of the Harlech Horst was intense enough for significant melange development on its northern flank in Arenig-Llanvirn times - perhaps they are accommodation structures associated with that process. The source of the metals present in the sulphides of the gold-lodes is considered to be the basic-intermediate Bryn-Teg volcanic formation and, more speculatively, a basic to ultrabasic basement beneath that. Two lines of evidence strongly support the contention (Shepherd & Bottrell, 1993). Firstly, sulphides in the Bryn-Teg volcanics have a much better sulphur-isotope correlation with the sulphides of the gold-lodes, compared to the 34S-enriched sulphides occurring within the Cambrian strata. This feature points towards an externally-derived hydrothermal fluid. Secondly, the alteration geochemistry of the gold-lodes includes the addition of Cr and Ni to the wall-rocks, even where these are altered basic intrusives, and early vein chlorites are Mg-rich and Mn-poor. These are features interpreted as indicative of fluid derivation from a basic-ultrabasic source terrain. On the subject of the basement to the Harlech Horst, it has indeed been proposed, following regional geophysical surveys, that there exists a magnetic core to the Dolwen Pericline, in the centre of the Harlech Horst. The proposal was suggested to explain the amplitude of one of the strongest magnetic anomalies in the area. Basic/ultrabasic rocks at depth would fit with this, although of course confirmation is required! In his PhD thesis, J.W.G. Gilbey (1968) cited a maximum formational temperature for the gold-lodes of 535oC at a pressure of 2.4 kbar. These figures were based on the upper stability limit for co-existing pyrite and arsenopyrite (temperature) and a burial depth approaching 10 km (pressure). The latter was based on the assumption that the full Lower Palaeozoic succession was once present in the area. The post-Cambrian history of the Harlech Horst, however, has involved significant incremental uplift. There is no certainty at all that the Lower Palaeozoic succession seen elsewhere in N Wales was deposited over the Horst to anything like its full thickness. Therefore, an estimate based on the assumed presence of the full Lower Palaeozoic succession is, by definition, unsafe. Hence, these maximum P-T estimations are likely to be way too high. More recently, three new temperature estimates for the gold-lodes have been produced, based on fluid inclusions, sulphur isotope exchange and mineral stability data (eloquently summarised in Shepherd & Bottrell, 1993, from where other important references may be obtained). These data all point to formational temperatures for the lodes of around 300oC, with an estimated pressure of 1.8 kbar. These figures would seem to be much more reasonable. Work has also been done on the relationship between the gold-lodes and the maximum P-T conditions reached during regional metamorphism. "Peak" metamorphic conditions were estimated, from immiscible fluids trapped in fluid inclusions in "metamorphic quartz veins", to have been in the order of 365oC and c. 3.0 Kbar. When this work was published, it was suggested that between the metamorphic peak and the mineralising event, there had therefore been a substantial decrease in pressure but only a small drop in temperature. At the time, however, the lodes were still thought to post-date the Acadian deformation and regional metamorphism. The discovery that the gold-lodes in fact pre-date the main Acadian deformation invited a reinterpretation of the data, particularly regarding timing of lode emplacement relative to the metamorphic "peak". But just how is such a "peak" defined? Two common types of regional metamorphism are strain-related (occurs during deformation, resulting e.g. in cleavage development) and burial-related (the deeper a rock is buried the more it gets pressurised and heated). Both will occur in the life cycle of a sedimentary basin that deepens, fills and is then obliterated by deformation. Logically, burial-related metamorphism ought to reach its peak when the maximum depth of basin-fill is attained. However, the "metamorphic quartz veins" giving the 365oC and c. 3.0 Kbar P/T data cited above have, I suggest, nothing to do with burial-related metamorphism. These "metamorphic veins" are instead mineralised brittle fractures, typically hosted by relatively competent bodies of rock (including the gold-lodes) that opened up as they were deformed during the Acadian strain-related metamorphism, whilst the more argillaceous rocks such as the Clogau shales deformed in a more ductile manner. Because of our incomplete understanding of how much of the Lower Palaeozoic succession was deposited over the Harlech Horst, we have no idea when burial-related metamorphism peaked in this area. What we do know is that the lodes pre-date the regional Acadian deformation; we know that brittle fractures formed during that deformation were mineralised with "White Elephant" quartz and - given that the "White Elephant" quartz falls into the paragenetic group "metamorphic quartz veins", we have P/T data for that. The available data therefore indicate that the gold-lodes were formed at ca. 300oC and at 1.8Kbar, at some point after the end of the Cambrian Period but prior to the regional Acadian deformation. They subsequently experienced a substantial pressure increase (up to 3.0Kbar) coupled with a moderate temperature increase (up to 365oC) during the Acadian deformation and associated regional strain-related metamorphism, which resulted in their folding, boudinage and mineral recrystallisation. The relationship between lode emplacement and peak burial-related metamorphism is still unknown. 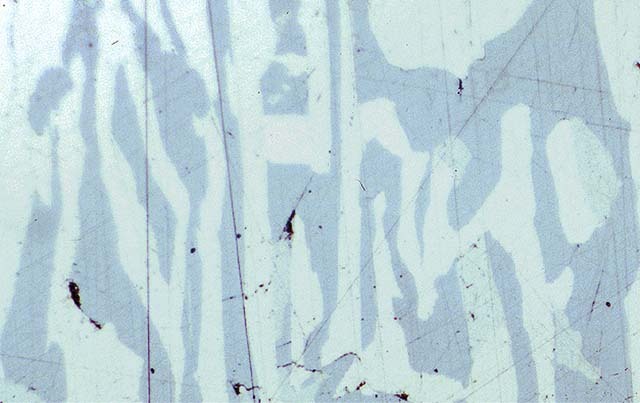 Fluid-inclusion studies at Clogau mine, during its working in the 1980s, enabled correlations to be made between gold grades and variations in the bulk composition of inclusion fluids (Shepherd & Bottrell, 1993). Particularly, fluid inclusions in quartz in gold-rich areas contain increased levels of methane. Studies also indicated that the most likely transporting mechanism for the gold, within the hydrothermal fluids, was as a bisulphide complex. Put simply, the generation of methane by the reaction with graphite (above) leads to a further process in which sulphide activity in the hydrothermal fluid is strongly decreased, leading to gold bisulphide destabilisation - and thereby deposition of gold. This reaction does go some of the way to explain why there is a particular association with black carbonaceous shales and high gold grades. But it does not explain why, in the vast tracts of shale-hosted lodes, the gold-shoots are so localised and high-grade. That story remains to be told! Late, undeformed post-Acadian veins occur commonly in some parts of the Gold-belt. They contain a mineral assemblage which is dominated by bands of coarsely crystalline calcite and marcasite. Sphalerite, pyrite, quartz and galena are also present in places. They are relatively rare at Clogau and other mines in the SW sector, but they are particularly abundant in Gwynfynydd area. They cut, but rarely displace, the gold-lodes. Beyond the Gold-belt, they are also found across Snowdonia and were particularly abundant in the Llanwrst district where they were mined extensively for lead and zinc. They therefore occur on a far more regional basis. Data obtained so far indicate them to be barren in terms of gold content! An Upper Palaeozoic or even lower Mesozoic age sees likely, the veins having formed by dilatant fissure-fill on a predominantly N-S trend. An extensional tectonic regime related to adjacent sedimentary basin development in the Irish Sea area seems as likely a scenario as any given present data. Above: banded sphalerite, calcite and marcasite from a post-Acadian fissure-vein, Dolgellau Gold-belt. Sample is ca. 30cm across. Mesothermal gold-lodes, cutting Middle to upper Cambrian sedimentary rocks (with associated, highly altered intrusives), were probably formed at temperatures of ca. 300oC and pressures of ca. 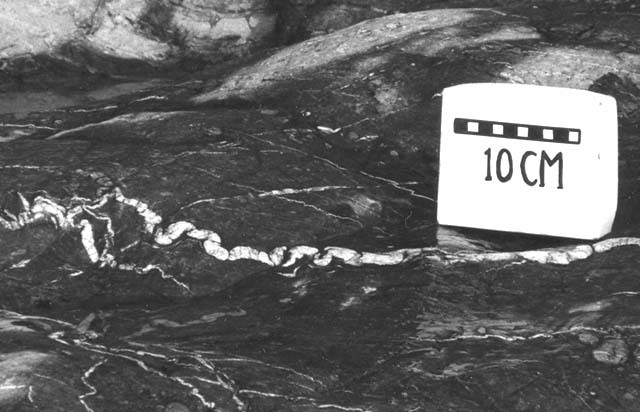 1.8Kbar during early Ordovician times. Gold enrichment occurred at suitable structural/lithological locations to create high-grade ore-shoots. Acadian deformation in Devonian times folded and boudinaged the veins, resulting in extensive mineral recrystallisation and the development of low-angle late quartz pods. Further work is required in order to better constrain the age of the gold-lodes. Allen, P.M. & Jackson, A.A., 1985. Geology of the country around Harlech. Memoirs of the British Geological Survey. Explanation of sheet 135, with part of 149, 112pp. Gilbey, J.W. 1968. The mineralogy, paragenesis and structure of the ores of the Dolgellau Gold Belt, Merionethshire, and associated wall rock alteration. Unpublished PhD thesis, University of London. Hall, G.W. 1990. The Gold Mines of Merioneth. 2nd ed. 99pp. Griffin Publications, Kington. Mason, J.S., Bevins, R.E and Alderton, D.H.M. 2002. Ore Mineralogy of the mesothermal gold lodes of the Dolgellau Gold Belt, North Wales. Transactions of the Institution of Mining and Metallurgy (Section B, Applied earth science), 111, B203-B214. Mason, J.S., Fitches, W.R and Bevins, R.E. 1999. Evidence for a pre-tectonic origin for the auriferous vein-type mineralisation in the Dolgellau Gold-belt, North Wales. Transactions of the Institution of Mining and Metallurgy (Section B, Applied earth science), 108, B45-B52. Rice, R. & Sharp. G.J. 1976. Copper mineralisation in the forest of Coed-y-Brenin, North Wales. Transactions of the Institution of Mining and Metallurgy (section B), 85, B1-B13. Shepherd, T.J. & Bottrell, S.H. 1993. Dolgellau Gold-belt, Harlech district, North Wales. In: Pattrick, R.A.D. and Polya, D.A. (eds): Mineralisation in the British Isles, 187-205. Chapman and Hall.